View showing the NNW face of the stone, with Mr Stratford Halliday, RCAHMS. 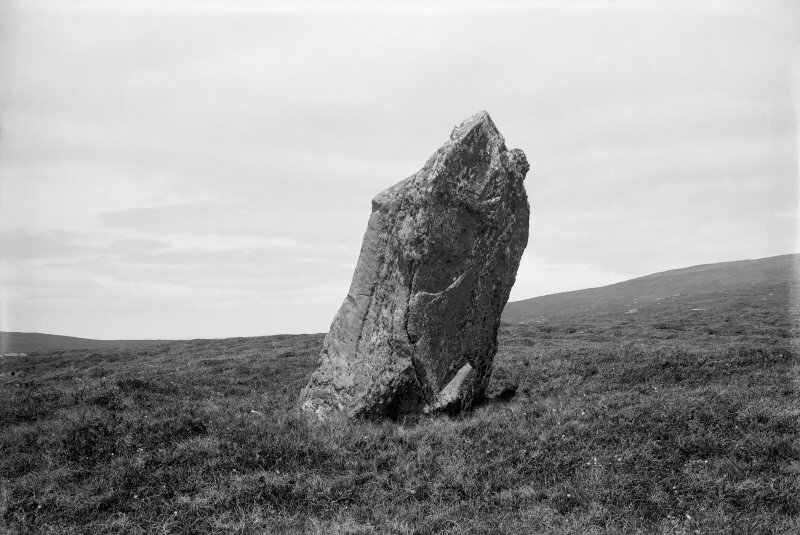 Standing stone, Clach Bharnach Bhraodag, Beinn a' Charra. 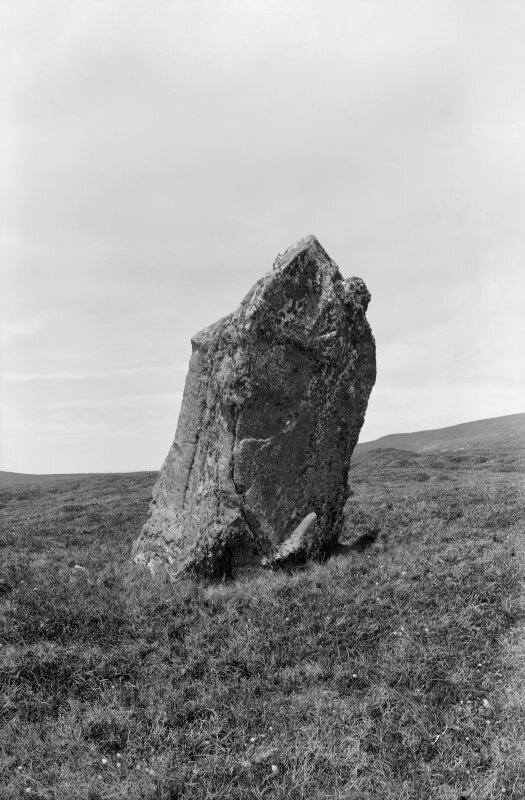 This standing stone is situated on the summit of Beinn a' Charra, near the Committee Road. 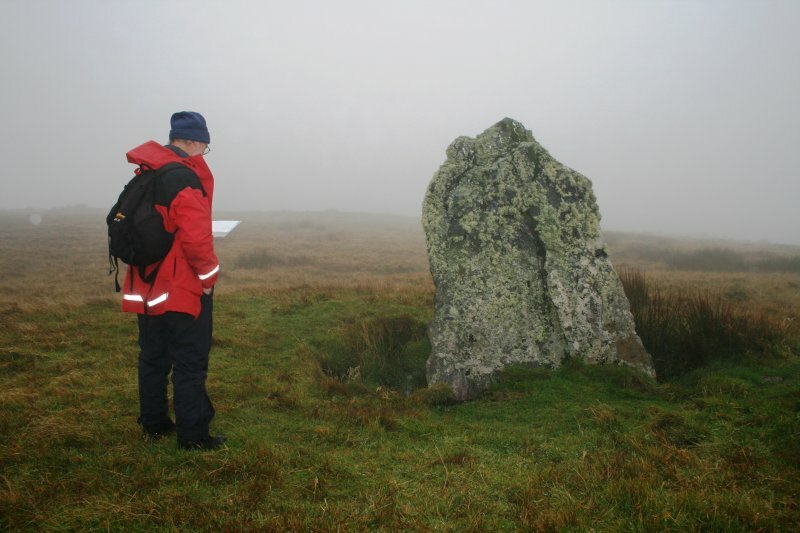 It is 9ft 3ins high and about a yard off the perpendicular, sloping towards the S.
A standing stone, as described. Visited by OS (J T T) 5 June 1965. 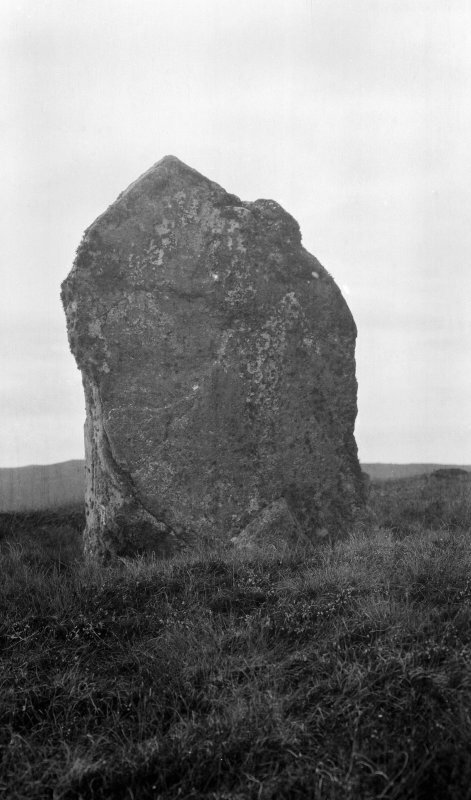 This massive standing stone is known as Clach Bharnach Bhraodag - "limpet stone of Freya". It measures 9ft 3ins above the surface of the surrouding peat, 6ft 6ins in breadth and 2ft 6ins maximum thickness. On the SE side of the stone, where the peat has been removed, the stone descends at least 2ft 6ins below the surface. Stone now 2m off perpendicular and a hole on S side is 50cm deep. Information contained in letter from Van Hoek 1980. Situated towards the SW edge of the summit of Beinn a’ Charra, this impressive stone still stands 2.7m in height, though it now leans towards the SSE, where there is a marked hollow around its base. Here it measures 2m in breadth at ground level, and narrows from 0.6m in thickness on the WSW to a point on the ENE. Veins of quartz are exposed on its NNW face.